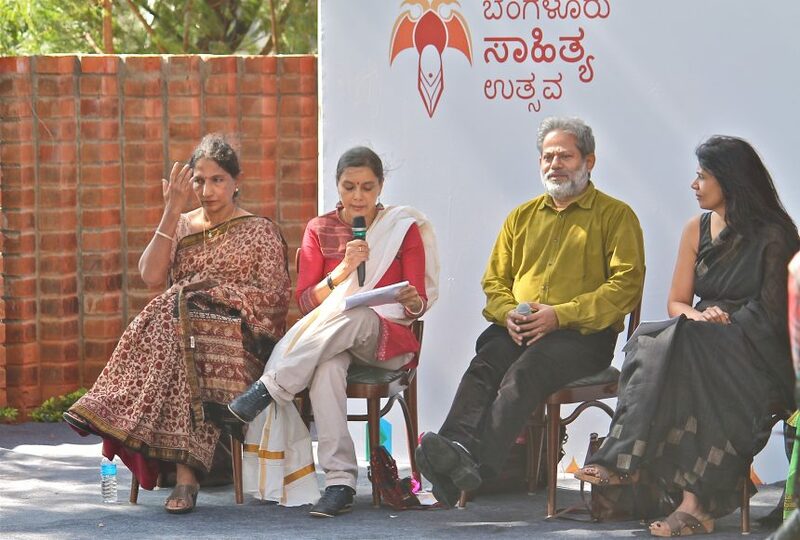 The Right Wing at BLF 2015 witnessed the beginning of this year’s poetic impulse with stalwarts from Kannada, Bengali and English poetry reciting their finest works. BLF organiser and acclaimed writer Shinie Antony set the ball rolling with her poetic take on “WORD” where she addressed the significance of words and how they are used and abused in multiple contexts. It is enthralling to see how poets Kanaka Ha.Ma., Prajna Mattihalli and Tulasi Venugopal could manage to tell the whole story in a matter of a few eloquent words and provoke our thoughts on issues as trivial as a crying baby, rains, weather, etc. Famous Bengali poet Subodh Sarkar also joined the lyrical revelry with ‘Mothers of Manipur’, ‘Poet’, and ‘Where is the Good Place’, drawing our attention and thoughtfulness towards the beauty of Manipur, the abduction of Manorama, poetic challenges and clash of Soviet Union. The poet also expressed his opinions on the issue of intolerance saying that writing is a solitary process and it should be kept away from political events. “If it is a genuine poem, it goes beyond languages and can conquer ages,” said Sarkar.